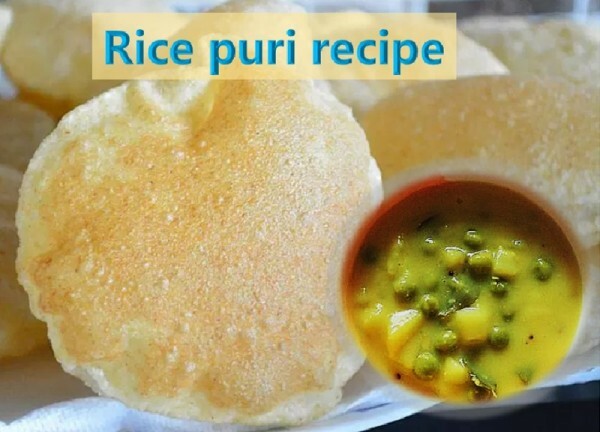 Puri is one of the popular breakfast or evening snack item in India. Puri – saagu combination is a popular choice of many and it is easy to prepare. Generally, plain puri’s are prepared using wheat flour. Here we are presenting rice puri recipe. It is as delicious as wheat puri. It can be a breakfast or evening snack item. In a bowl add rice flour, liquid clarified butter and turmeric powder. Mix well. Now add masala paste and mix the flour. Add little water if needed while mixing and prepare dought. Heat oil for frying on medium heat. Take a small lemon size dough and roll it. You can get ready with several of them and place it on a plate or flat surface. Transfer puri on paper towel. Let it absorb extra oil. Serve hot puris with saagu or curry or coconut chutney.